Are you ready to make your first banner display campaign on ExoClick? If you are then follow through this guide and you will learn how to create a campaign YOU want with ease. I will go on and explain each step I make in enough detail so it’s easily understood. Go to New Campaign on your admin panel and then click on General Targeting. There are only a few fields to set up here. – Campaign Name – First you need to pick a name for your campaign. ExoClick recommends using this format ‘Product – Country – Site & Adspot if targeted’. – Categories – Choose the categories you wish to target. There are three types. Adult, Entertainment & Lifestyle and Streaming & File Sharing. Each of these categories has subcategories that help you target a specific category. For this guide I will pick Adult for example, and check Asian. It is of great importance that you pick the correct category you wish to advertise, otherwise ExoClick will not approve the campaign. – Ad Format – Since we are making a banner campaign choose the right format that matches your campaign. 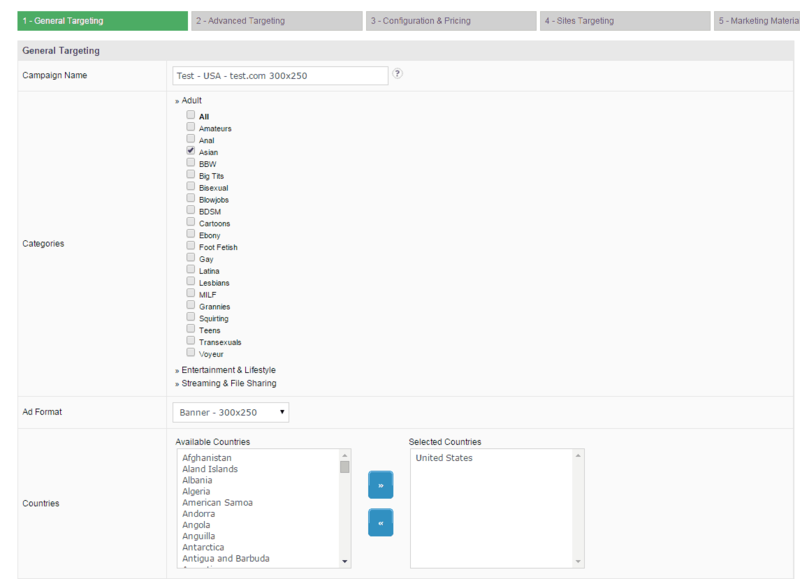 – Countries – Select the countries you wish to target and place them into the Selected Countries box. If you chose USA for example but your banners are in German, you will have worse results than if they were in English. You can now move on to the next step. Moving on to the next big step which is Advanced Targeting. Here you can select languages, browsers, operating systems, mobile carriers and devices. On default they have ‘All’ selected. Of course you can just choose what options you want by clicking on the ‘Select some…’ button. It gets more interesting with each step. In this step we are going to set up Configuration & Pricing. – Select the Pricing Model, ExoClick supports CPM, CPC and smart CPM. If you choose CPC, you cannot use the Frequency Capping. If you want to use CPM or smart CPM then enable or disable Frequency Capping. – Set your minimum bid. The higher the bid the more traffic you will receive. You can also check out ExoClicks rates table which is separated by Country. – Set your Max Daily Budget. This limitation might not be respected depending on your target options. – Choose an Ad Group to classify your campaign, but since you are probably creating your first campaign here, you maybe don’t have an ad group. In that case, you can just click on ‘Manage Groups’ and name your group. But this field is not that important if it’s your first campaign. In this step you will have to choose between RON or Premium network selection. We will choose Premium for this guide just to show you the list. When you select Premium you will get a list of all their Premium sites. Another interesting thing to know is that if you chose CPM or smart CPM, you can customize the bid for each selected Premium site. In the Marketing Material tab you will find the URL field and the Image box. – In the URL field insert your landing page. – Click on the image box, then find and select the banner you wish to add. Make sure that the banner matches your selection in the first step. The banner will automatically be active. This is the last step where you make the final touches to your campaign. But also a very important part. This is where you will set the Ad Schedule, make sure to select the right Timezone as well. The most important part is the Domains Targeting. You can either target or block a site. You can block sites by adding a ‘-‘ symbol in front of the name of the site. When you have completed all 6 steps you can click on Save Campaign. And that’s it. This is how you make your campaign in 6 steps. NOTE: Make sure to check ExoClick’s guidelines before saving the campaign so you’d avoid getting rejected. By saving you automatically accept the guidelines and you will be redirected to pending campaign area. When you get this far you just need to wait to get your campaign approved. If your campaign gets rejected, ExoClick will let you know the reason why. This concludes the guide, it’s very easy, especially if you understand what kind of campaign you want, who to target etc.. Have it a go yourself and I’m sure you will get to love ExoClick. Think paying CPI is a safe bet? Think again! How I lost $2.2k in 7 days without knowing about it!